» Archived Review: LESLIE CHARTERIS – The Saint in Trouble. Archived Review: LESLIE CHARTERIS – The Saint in Trouble. LESLIE CHARTERIS – The Saint in Trouble. Detective Book Club; hardcover reprint (3-in-1 edition), May 1979. Coronet, UK, paperback, 1978. First UK hardcover edition: Hodder & Stoughton, 1979. Doubleday Crime Club, US, hardcover, 1978. No US paperback edition. Although this reprint volume doesn’t mention it, Charteris apparently had very little to do with this book. According to Al Hubin’s Crime Fiction IV, the book was adapted by Graham Weaver from original teleplays by Terence Feely and John Kruse. In “The Imprudent Professor”, the Saint (Simon Templar, aka Sebastian Tombs) helps prevent a scientist from defecting to the Soviet Union. It seems he has a solar energy alternative to fossil fuel, and the Free World cartels insist on keeping the discovery covered up. The sunny Cannes background is nice, and Simon meets at least two very good-looking young ladies, but (as far as I can tell) one of the pieces of evidence the Saint proceeds on never occurred. 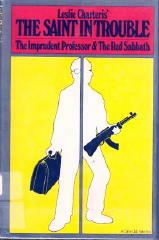 To verify that certain things never change, in “The Red Sabbath” Simon returns to London to help a (good-looking) female Israeli agent track down a Arab terrorist trying to defect from his comrades to South America. Again we get a intimate inside look at the London underworld, but beyond that, it’s a matter only of luck and fortunate timing that helps the dashing modern-day privateer prevail. Except for the lapse of a kind mentioned above, the writing is polished enough, but the stories themselves are rather superficial and perfunctory. A disappointment. The series played in the US as The Friday Late Night Movie on CBS, or so I understand, but I don’t remember seeing it, or even knowing about it — and in spite of my generally negative reaction to the book, I’d have liked to have. Maybe copies still exist? I’ll check into it. As far as I know, the only Saint novel to contain original Charteris material after about 1960 was Salvage for the Saint, and that only because it was based on stories Charteris wrote for the long running Saint comic strip drawn by Mike Roy and later John Spanger and Doug Wildey (TV’s Jonny Quest). I’ve read that he also wrote original stories for the Saint comic book too, but all the ones I’ve seen were reprints of the comic strip. 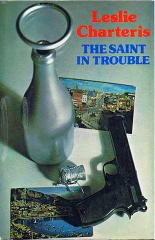 Towards the end of the run of the Saint television series and the Saint Mystery Magazine Charteris authorized novelizations of the series and several were run in the magazine and later reprinted in hardcovers and paperback. None of them really capture the Saint or Charteris, though the best is probably Vendetta for the Saint by veteran American sf writer (Make Room Make Room, the basis for Soylent Green and the Flash Gordon comic strip) Harry Harrison, based on a two part episode of the series and released as a movie. I don’t know how many of these were done, but they did continue into the Ian Oglivy Return of the Saint series. The last Saint book solely by Charteris was the 1963 short story collection “The Saint in the Sun” making the last Saint novel solely by Charteris the 1946 story “The Saint Sees It Through”. Some of the latterday collaborations do indeed read like novelisations, but some of them read quite close to original Charteris. Charteris was never shy about crediting his collaborators–except Harry Harrison because he didn’t want his name on the book–and always edited the manuscripts before they went to print.